← You are drinking Rosé this summer, aren’t you? Despite the fact that one of my neighbors is still shooting off 4th of July fireworks every evening, harvest started in the Napa Valley today. Yes, that harvest. The grapes. The grapes that make the wine that makes all this (making circular gesture with my hand as I gaze out over the valley) so amazing. …and then showers the grapes with wine. Oakville appellation today. Starting at 6am, they picked 16 tons of Pinot Noir grapes, which is above normal as far as yields go, although down a bit from last year’s 18 tons, according to winemaker Ludovic Dervin. Today’s harvest is 2-3 weeks ahead of the usual schedule (and two days ahead of last year), but the recent spate of high temperatures and high humidity made the early harvest of this vineyard necessary. Mumm makes sparkling wine of course, and unlike the grapes used to make Napa’s famed Cabernet Sauvignon wines, Mumm’s grapes are picked at lower Brix (sugar) levels, when they have higher acidity. Most of the Cabernet makers won’t harvest until mid-October, weather permitting, as they desire as much hang time on the vine as possible to make their sultry, opulent (expensive) red wines. 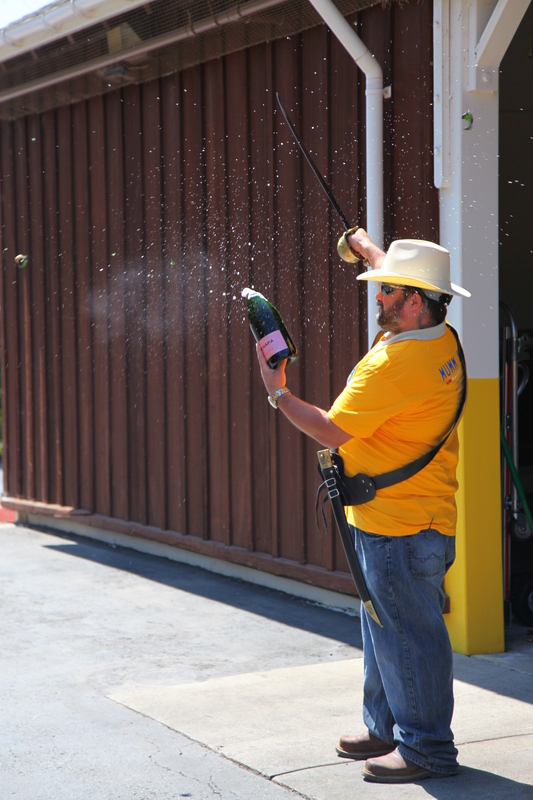 But now that Mumm has kicked things off, other wineries will soon be picking also, starting in the Carneros region (the southern part of Napa) with Chardonnay and Pinot Noir grapes. 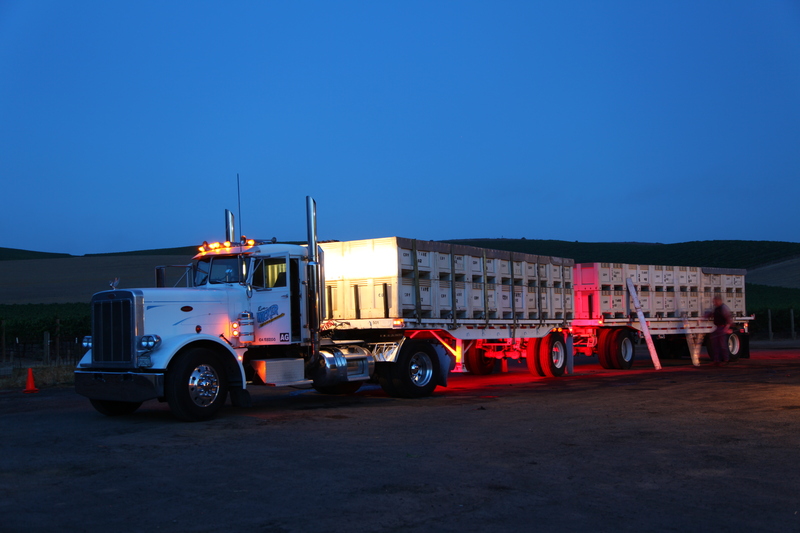 For us locals, it means we’ll see spotlights in the vineyards in the middle of the night as workers hand- and machine-pick the valuable fruit. It means we’ll see a lot more trucks and tractors on the road, not to mention thousands of those ubiquitous white grape bins. And it also means I will undoubtedly hear the flatulent sound of the airbrakes on Ron Wicker’s reliable old Peterbilt at 6am as he hauls 24 tons of grapes at a time up the valley to waiting winery workers. This is magic time in the Napa Valley, make no mistake about it. 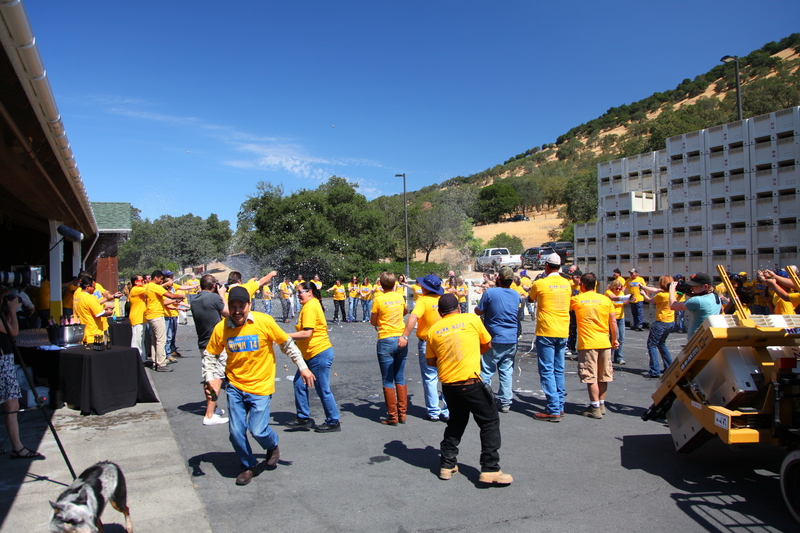 The energy and enthusiasm in the air is palpable, and everyone who lives here, or visits during this time, feels it. While outsiders may wonder “Doesn’t the whole idea of harvest get old after awhile? I mean, you do it every single year”—it doesn’t. Each year is a new beginning; the chance to make a new vintage of wine. Each harvest is full of calculations, watching the weather, guessing the right time to pick. It’s a logistics game for many, as you have to have the right workers and equipment at the right vineyard at the right time, or you may miss your window of opportunity. 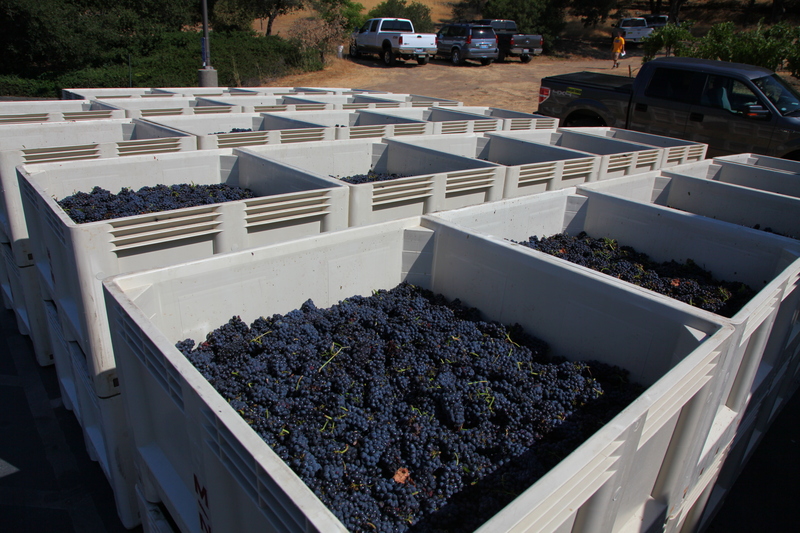 Winemaker Dervin, for example, only decided two days ago that harvest would begin today. ..and then promptly douse each other. 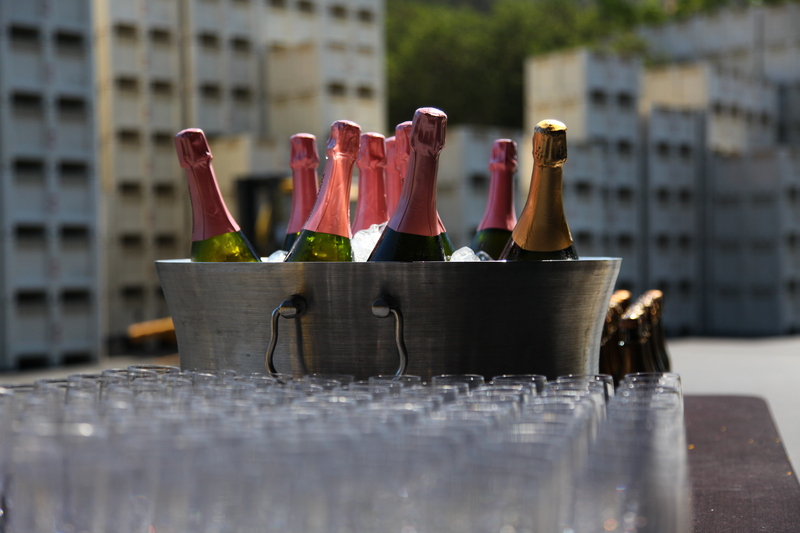 the huge volume of sparkling wine that Mumm will produce this year. 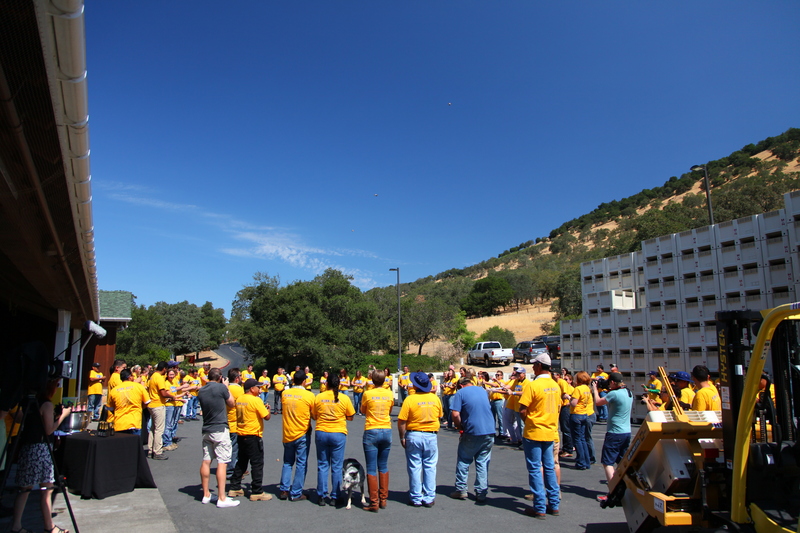 The blessing of the grapes and the celebration that I witnessed this morning will be repeated up and down the valley over the coming weeks, and every team at every winery will experience the adrenaline rush that is harvest. As a resident about to experience my fourth harvest, I am still awed by the way everything comes together to put fermented grape juice in bottles. It takes an amazing number of people and machines, art and science, skill and luck, to make some of the best wines in the world. It also takes a community, and an infrastructure to support that community, or none of this would happen. So for me, and for thousands of others who live in wine country, today is a day to rejoice, to be thankful, and to get down to work. 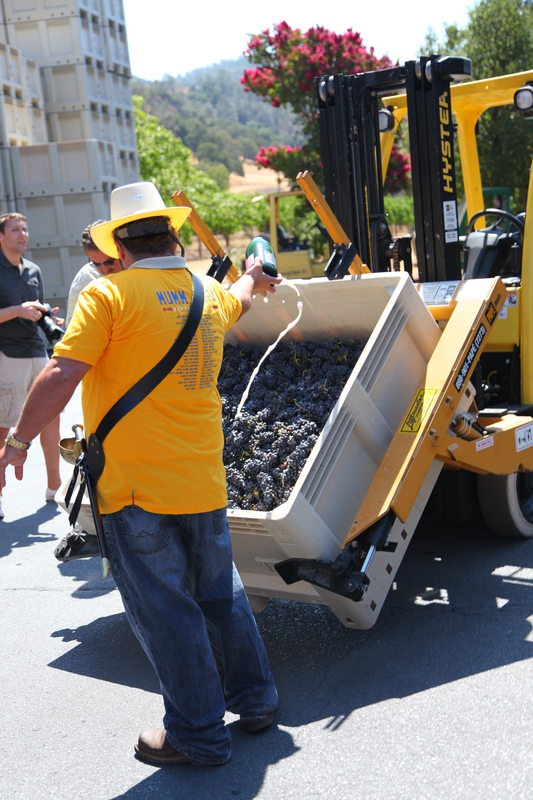 This entry was posted in Napa, People, Wine and tagged harvest 2014, Mumm Napa Valley, sparkling wine, Wine. Bookmark the permalink. 1 Response to Harvest 2014 is Underway!